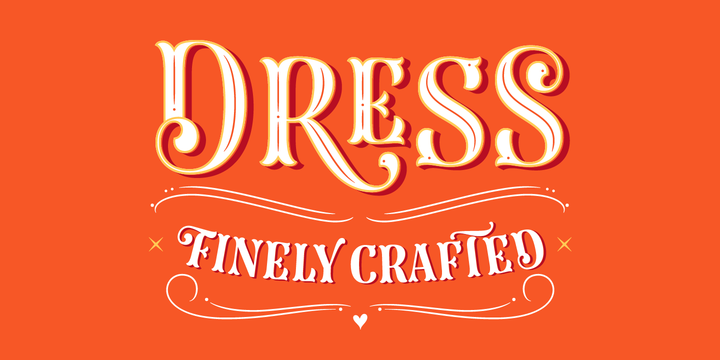 Dress is a typeface created by Sabrina Marinela Lopez and published by Typesenses which is available in 13 styles, inspired by different characters of 19th century. It has some Alternates, Layers (Base, Shade One & Two, Inline One & Two, Outline, Deco, Ornaments). You can mix them (five Combos) and it has Decoration per letter. It is suitable for any kind of project such as display use, book cover, packaging, greeting card etc. Also it matches well with Limon script. Enjoy your new Dress! Styles: Base, Shade One & Two, Inline One & Two, Outline, Deco, Ornaments, Combos (One, Two, Three, Four, Five). A font description published on Saturday, April 28th, 2018 in Fonts, Sabrina Mariela Lopez, Typeesnses by Alexandra that has 1,670 views.